UDM Downloads > Concentration - the Memory Games! Concentration - the Memory Games is a full featured memory game of the card pair flipping style that combines tradition and innovation. 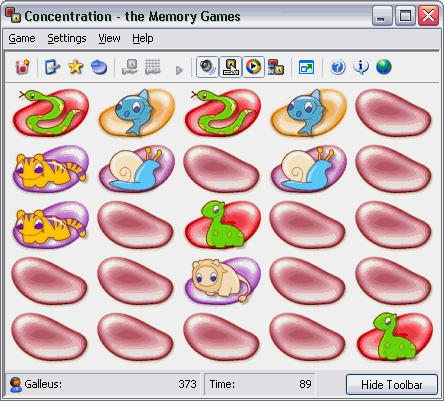 Played by a single player against the clock and high score table, or against human or computer opponents, improves memory and concentration during the game. Includes tournament play for the persistent player and statistics for the scientific one. See how randomly moving and teleporting cards challenge you. Believe us, extreme teleport is really extreme and the 'change unmatching pairs' option will quiz your concentrating mind for sure. Joker card and an extra bonus match card flavor the game play, just as "gravity" does. Try the Duel game mode to play concentration the new way against an opponent. Download self-installing true color card sets. Match identical sounds or images and cards with animated faces. Play in associative mode to match images that are related or to match card images to descriptions. Play with pairs that consist of two, three or four identical cards on boards that range from small to enormous (40 pairs). Customize Concentration - the Memory Games to your taste. Change automatic card flip delay or flip the cards yourself, select animations or race against the clock without them. Play stress-free if you want to. Configure your board layout, if you have a large desktop, use it by maximizing the game window. Be "messy" if you want to. Play on full screen. Save your settings just in case your family finds your copy of Concentration - the Memory Games as well. And finally, don't forget to have fun. Follow card set and feature updates, special offers at our blog. For a registration price of US$15 registered users have the following benefits: Branding with user's name, free license for future versions, nag screen removal, enhanced boss key feature, use of shareware card sets, automatic blog update notification.